You can use this map to explore the data we have collected about settlement activity in the West Bank. The map is organized in several layers that show different kinds of data. “Settlement” is the term used to denote Israeli civilian communities built in territory conquered by Israel in the Six Day War (June 1967). This territory is comprised of the West Bank (including East Jerusalem), the Gaza Strip, the Golan Heights and the Sinai Peninsula. These neighborhoods have been a major issue in the peace process since 1967 and remain highly controversial. It’s probably Apple’s most politically-charged app, and looking at comments and reviews on the iPhone download page or web posts about the product make one thing pretty clear: Jews love settlements and iPhones. Maybe Muslims are Android-users. I’d like to suggest a similar app for Jews interested in settling. The iSettled app would track new marriages all over the Upper West Side. Layers would show number of kids, tax bracket and number of blocks to the nearest synagogue. Links directly to your J-Date account! 1995? There’s an app for that. Alice in Chains has broken forth from the shackles of where-are-they-now obscurity and reappeared in the likeliest of places. To accompany the Black Gives Way to Blue album release, their first batch of new material in a decade and a half, the band this week launched the Alice in Chains iPhone app. See the video for a riveting walk through. You can “spin things, flick it, turn it,” among other nifty moves, like pressing things and moving ’em around, holding and pulling them. You can also share the three included tracks with friends via facebook, twitter and email, and buy tour tickets and merch. The guy doing the hands-on demo says you can “reveal certain things.” If anyone out there discovers that the app can “reveal” the origin of his accent, please let it be known. Aelice in Chaaynes aelbum? What is that, Fargo by way of Raleigh? Course, that’s a whole ‘nother can of worms/jar of flies. The World Wide Web is just brimming with useful information, neatly packaged in quickly digestible bite-sized morsels of information, tagged and labeled for easy finding with the superlatives we crave. In our fast-paced society you don’t just want a way to a trimmer tummy, you want the Fastest Way to Flatter Abs. Strapped for cash? What’s the cheapest way to get to Mexico? (Try deportation.) Sexiest celebrities. Most extreme car chases. Man versus Beast. (OK, I got carried away. I just wanted an excuse to link to this. And this. And this!) Moral of the story, we want the best and we want it now. We also want the worst. 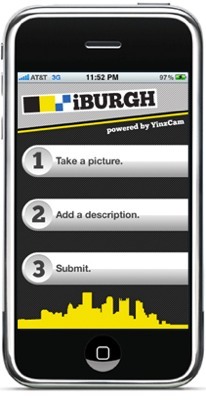 A new iPhone app from the great city of Pittsburgh allows concerned citizens to snap geo-tagged shots of potholes and other signs of crumbling infrastructure, and send them directly to the local govs. Next I propose iBurg, which will let you zap insto-complaints of style infractions and ultra (un)hipitude from Bedford Ave in Williamsburg, BK straight to Gracie Mansion.